Current centralised healthcare models pose many challenges, particularly for developing countries such as South Africa, where travel and time costs make it difficult for patients to seek healthcare, even when urgently needed. To address this issue, point-of-care (PoC) tests, which are performed at or near the site of clinical care, have gained popularity and are actively being developed. Microfluidic systems, in which small volumes of fluids can be processed, provide an ideal platform on which to develop PoC diagnostic solutions. Specifically, the emerging field of paper-based microfluidics, with advantages such as low-cost, disposability and minimal external equipment requirements, provides unique opportunities for addressing healthcare issues in developing countries. This work explores the field of paper-based microfluidics, with step-by-step instructions on the design, manufacture and testing processes to realise paper-based devices towards diagnostic applications. Paper-based microfluidic and electronic components are presented, as well as the integration of these components to provide smart paper-based devices. This serves as an educational tool, enabling both beginners and experts in the field to fast-track development of unique paper-based solutions towards PoC diagnostics, with emphasis on the South African context, where both the need for and impact of these solutions are great. Point-of-care (PoC) tests are laboratory diagnostic assays performed at or near the site where clinical care is delivered and may therefore be used in both a first world laboratory and the most remote corner of the developing world. In the latter case, these tests have the ability to overcome many of the disadvantages of centralised testing facilities because they are low-cost, provide faster test results, and negate the need for samples/patients to be transported over long distances. As a result, PoC tests promote regular patient and/or environmental sample testing, enabling more effective health monitoring across large geographical regions and populations. This early warning system serves to significantly reduce the impact of disease. Microfluidic paper-based analytical devices (uPADs)9 - or microfluidics 2.010 - have received substantial attention in the recent past as an attractive solution for implementing low-cost diagnostics at the point-of-care, because the technology has a number of desirable features, both from a technical and a social impact perspective. Coupled with the use of a low-cost paper substrate, paper-based microfluidic devices enable sample flow through capillary action, negating the need for pumps or electricity. The use of microscopes can also be eliminated by employing colour change reactions identifiable by eye, a method preferred at the PoC as it requires minimal user interpretation. Paper provides the ideal background contrast for evaluating colour changes. Moreover, reagents can be stored on paper in desiccated form which helps to prolong the shelf life of the devices. This allows them to be delivered in bulk to remote testing locations. Paper is thin and lightweight, so the devices are highly portable and easy to transport. Although paper-based microfluidic devices have become analogous with common paper tests like the pH test strip and home based lateral flow pregnancy tests,11 these devices also offer improvements to lateral flow technology by enabling multiplexed analyses, without making the test results ambiguous. Various applications for paper-based microfluidic devices, as well as various manufacturing techniques, have been reported in several reviews.11-13 By employing less specialised paper types for manufacture and a more efficient high throughput fabrication process, the overall cost of the tests are reduced.14 Wax printing manufacturing14,15 has become the preferred choice of manufacture because of its simplicity and ability to enable mass production at low cost. Three-dimensional (3D) paper microfluidics were introduced by Martinez et al.16, wherein the unique multiplexing ability of these devices was demonstrated. Later, Liu and Crooks17 improved the fabrication method by using the ancient Japanese technique of folding (origami) to stack together the various layers of the 3D device. Furthermore, combinations of microfluidics, micro-electronics and micro-optics provide remarkable opportunities for advancing the biosensor industry, for example, the Clearblue Digital Pregnancy Test18 is a disposable lateral flow test powered by a small button-cell battery and performs an optical measurement, while displaying semi-quantitative results on an LCD screen. Printed electronics19 have also received significant recent attention for the ability to enhance diagnostic device functionality without compromising the attractive features of paper- based microfluidics. Combining smart biosensors such as these with the simplicity, portability, disposability and low-cost multiplex analysis of microfluidic paper test devices, allows for the rapid high sensitivity analysis and realtime monitoring required from PoC diagnostics. Moreover, integrating all the functions on a single paper substrate would enable a quantitative analysis result without requiring an external reader - an objective which may be fulfilled by leveraging the rapid expansion of printed electronics technology. The digital and additive nature of printing processes, the range of materials that can be formulated as inks, and the possibility to cater to various production scales, ranging from prototype to large-scale, are some of the key factors that enable the deployment of printing processes in electronics fabrication. Printing is accessible to a broader audience, providing an energy-saving, environmentally-friendly alternative that can dramatically reduce the volume of raw materials consumed and waste generated when compared to conventional production methods. Printed electronics is still an emerging industry, with several key components at research level,19,20-23 but it is envisioned that cost-effective, autonomous, portable, environmentally friendly, and disposable printed biosensor systems for telecommunications connected PoC testing will become a reality, providing sensitive and quantitative multiplexed results. Compliance with many of the WHO ASSURED criteria positions the paper-based electronic microfluidics platform as a front-runner in achieving the goal of rapid, inexpensive PoC diagnostics. In addition, South Africa is ideally located to understand first-hand the challenges of implementing effective diagnostic devices for addressing healthcare issues in developing countries, enabling South Africans to be at the forefront of developing effective paper-based diagnostic solutions. Although there have been many publications focusing on specific manufacturing methods and applications of paper-based microfluidics, to our knowledge, there are currently no papers that have been published with the specific goal of assisting new users in the field. Papers have been published where the concept of paper-based fluidics has been used for educational purposes,24 but full workflows have not been given. This paper presents the basic steps for getting started with integrating paper-based fluidics with electronic functions for people with little to no experience in microfluidics or manufacturing. Step-by-step guidelines for the fabrication of an origami 3D paper-based microfluidic device using the wax printing technique, as well as the addition of electronic features are provided. The detailed protocols in this paper allow first-time users to fast-track their development work, whether it is for the creation of life-saving diagnostics or for the creation of educational tools. The aim is to evoke interest and insight into paper-based electronics-enhanced microfluidics in people from a variety of technical backgrounds, enabling the generation of creative, multi-disciplinary solutions applicable to health and the environmental challenges of the developing world. As an immediate application, the article introduces a paper-based device which may be utilised for educational projects, advancing the principles of paper microfluidics and relevant manufacturing techniques. An important intention is to create awareness and promote conversations that will further the applications of this field, and augment their impact on the world. In order to get started with paper-based microfluidics, individual components are first developed and then integrated into a functional device. The sections below take the reader through this process in a step-by-step manner. A 3D paper microfluidic device was designed and implemented using paper folding or origami principles.17,25 Initially, the size of the 3D microfluidic device must be determined. It should be sized to fit comfortably into the user's hand, and ensure that test result signals are easily visualised with the naked eye. For this demonstration, a 50 mm x 50 mm device was used. For wax printing, the distance between adjacent lines in the design should be no smaller than 2 mm. This spacing allows for wax spreading during melting, and prevents the channels from becoming clogged and consequently preventing fluid flow. The number of layers required in a 3D device will depend on the functionality required and the complexity of the detection mechanism. For example, should there be a need to only add reagents after the sample is loaded onto the device, then a layer must be incorporated into the device to serve this purpose. However, we have found it easier to either dry these reagents at the test result signal position itself (the final layer of the device), or mix them directly into the sample (should this be acceptable for the chemical reaction). For the purposes of demonstration, the design of a three-layer device is shown in Figure 1. In this device, a single sample can be used to perform three sets of analyses, demonstrating that 3D paper-based microfluidic devices are capable of performing multiplexed tests. Devices are designed using a standard computer aided design program. The design procedure for a 3D origami-type microfluidic network is illustrated in Figure 1, showing how layers are folded from a 2D design into a 3D stack, while performing the steps that follow. The shape of the test result signal(s) must be determined. Result signals can be words (YES/NO), icons (such as a tick or cross), or any other shape deemed relevant. Once the test result signal layout design is created, a mirror image of it must be used as a template for the design steps, as illustrated in STEP 1 in Figure 1. This is because once assembled, the user will turn over the device in order to read the result. In mirroring the design around itself, the original design remains centralised and will form the bottom layer of the 3D device after folding. This bottom layer of the device is depicted as layer A in Figure 1, and contains three test result signal shapes - the pentagon, the parallelogram and square -which will be viewed by the user after running the test. The other shapes and connection lines are part of the flow path, and will be discussed in further steps. The number of mirrored images that should be created depends on the number of layers needed in the device. Because three layers are being used for this demonstration, the designed bottom layer is mirrored twice, as shown in STEP 2 of Figure 1. Mirrored images should be spaced 1 mm from each other,26 creating inactive spaces where origami folds can be made during the assembly of the device. The vertical fluidic connections must be determined by verifying how the sample fluid will flow from the sample inlet at the top of the device to test result signal(s) at the bottom of the device. In Figure 1, layer C forms the uppermost sample introduction layer, layer B is the intermediate layer, and layer A is the bottom test result layer. The fluidic path design for this demonstration is enclosed in dashed lines of STEP 3 in Figure 1. As a result of the horizontally positioned device layers being in direct contact with each other after folding, the sample moves vertically downward from layer C, through to layer B, and down to layer A. Because layer B will be folded down directly onto layer A, fluid will move vertically downward between these two layers through the enclosed intermediate shapes - the circle, the hexagon, and the triangle. Within the dashed line, the sample will be loaded from the top into the enclosed hexagonal region on layer C. Layer C will be folded down directly onto layer B, so fluid will move vertically downward from the enclosed hexagonal region on layer C into the same shape enclosed region of layer B. Deleting the areas of the design not enclosed by dashed lines on layers B and C completes this step. The horizontal fluidic connections must be incorporated into the design. STEP 4 in Figure 1 shows the creation of the horizontal flow paths or channels required on layer B. Most of the enclosed intermediate regions of layer B - the circle, the hexagon, and the triangle - become filled with sample as a result of horizontal capillary fluid movement. Also, verify the fluidic connections between the sample inlet on the intermediate shapes of layer A - the circle, the hexagon and the triangle - and the test result signal shapes, the pentagon, the parallelogram and square. The design is finalised by shading the areas of the device not contributing to the fluid flow path, which represent the areas where hydrophobic wax will be printed. The wax will help to contain the fluid flow to only where it is required. The design as shown in STEP 5 of Figure 1 is now ready for printing, melting and assembly. For printing, a Xerox Colorqube 8870DN (Xerox, Bytes Technology Group, Johannesburg, South Africa) solid ink printer was used, as shown in Figure 2a. To date, wax printing has been the technique most commonly used for the manufacture of paper-based microfluidic devices, although various other techniques have also been used to create paper-based microfluidic devices using wax. Lu et al.15 used wax pens to draw on the desired hydrophobic patterns, Dungchai et al.27 used a wax screen printing technique and Songjaroen et al.28 created devices using a wax dipping technique. While all these methods require minimal investment to perform, they suffer from poor reproducibility and are not well suited for mass-production. Using a solid ink printer has therefore proven most efficient as it provides better design resolution, is less labour intensive and provides a higher manufacturing throughput. Solid ink printers function by heating up blocks of wax (considered the ink cartridges in these printers) and depositing the molten wax onto the paper. The wax components used in this work were Cartridge-Free ColorQube inks, compatible with the 8570/8870 Xerox ColorQube printer range (Xerox, by Bytes Technology Group, Johannesburg, South Africa). The available colours are magenta, yellow, black and blue, which can be combined in different ratios to produce any colour required. Once printed, the ink cools rapidly, and is then ready for use. Chromatography paper (Whatman Chromatography paper no. 1, Merck, Johannesburg, South Africa) has been the substrate of choice for creating paper-based microfluidic devices.9 These papers are low cost, widely available and suitable for most chemical assays. After the design is printed, it is melted on a hot plate at a temperature of 255 °C for 1 min as depicted in Figure 2b. These parameters were found to be optimal in a separate study performed by Govindasamy et al.29 During melting, the wax layers on the paper surface are melted through the cross section or thickness of the paper. The wax barriers then serve as hydrophobic walls that guide the movement of fluids along the paper. The formation of a dark image on the reverse side of the paper indicates efficient melting. Figure 2c shows both the front and back of the device after successful wax melting. Once melted, the device is cooled down for 30 s and then cut out. Three-dimensional paper-based microfluidic designs require effective sealing between the layers of paper to ensure that fluid does not leak and that there is good contact between the fluidic connections, thereby ensuring the overall functionality of the device. Clamping of the paper layers can be used to achieve this,26 or alternatively, double-sided adhesive layers can be used to stick the layers together.16 Lewis et al.30 also demonstrated that spray adhesive can efficiently seal these devices and ensure good contact between the device layers. This technique is simple to use, low-cost and enables high-throughput production. This method utilises adhesive layers, with the required materials and equipment readily available. Using the paper device design as a template, the fluid flow path cut-out (i.e. the sections of the paper design not covered with wax) can be designed using a computer aided design program as shown by the grey shaded areas in Figure 3a. The adhesive layers are manufactured using pressure sensitive adhesive sheeting (Flexmount DFM 200 clear V-95 150 Poly H-9 V-95 400 H-9, Flexcon, Synchron, Johannesburg, South Africa), which is cut according to the specific design on a vinyl cutter plotter (Roland CAMM-1 GX-24, Telpro Management, Johannesburg, South Africa). The adhesive in the sections for fluid flow is removed using tweezers as shown in Figure 3b. The larger individual layer adhesive blocks can be cut out using scissors. Figure 4 illustrates the application of adhesive layers to the device to enable the 3D paper device to be assembled. In the case of the design shown in Figure 1, the adhesive is applied onto layers C and A before folding. Layer B is first folded onto layer A. A roller is used to apply pressure on this fold to ensure the adhesive securely binds these two layers together. Next, layer C is folded onto layer B. Pressure is applied once again and thereafter the device is ready for use. This ensures good sealing between layers B and C, and between layers A and B, respectively. The difference in the channel dimensions is negligible for lines that are designed to have widths greater than 1 mm. Tests carried out showed that lines with a design width of 1 mm resulted in printed lines that were 13% wider, while lines with design widths of 800 μm and 500 μηι gave printed lines approximately 25% wider. The small difference of the channel dimensions after wax melting enables the adhesive cut-outs to align well with the wax designs. The sealing effect of the adhesive on the wax devices was found to be problematic at times, with small amounts of fluids leaking between layers of the device. Different types of adhesives could be explored to optimise the sealing between layers. The assembled device is now ready for use. The end result of biological/chemical diagnostic tests is dependent on sensitive reactions to produce a signal. The reaction that takes place requires an analyte of interest (antigen, substrate, etc.) to make contact with the complementary detection agent (antibody, enzyme, etc.). The presence of the analyte in the sample solution (e.g. blood or urine) followed by contact between the analyte and detection agent is observed as a user-friendly result output (colorimetric, digital readout, etc.). A well-known example is a home-based pregnancy test, which relies on a paper-based lateral flow platform12 (Figure 5). Although popular, a drawback to lateral flow tests as observed in Figure 5, is that reactions are restricted to a single analyte and therefore a single result. Paper-based microfluidics employ the same principles as lateral flow tests, but can make use of hydrophobic channelling to create multiplexed assays.31 This section describes a colour reaction for a pH test whereby more than one sample is assayed on the same platform (multiplexing) using paper-based microfluidics. Laboratory and household materials were selected for use as analytes and red cabbage dye was used as the pH detection agent. Red cabbage dye contains a natural pH detection compound called anthocyanin, which causes a highly acidic analyte (low pH) to turn red, and a basic analyte to turn light blue or yellow. In preparation for the test, anthocyanin was extracted from red cabbage into distilled water. To achieve this, cabbage leaves were finely chopped, placed in the extraction solution, and heated in a microwave at a high heat setting for 1 min intervals. It is important to cover the solution to prevent evaporation and to stir the solution after each heating interval. It was noticed that the solution developed a purple colour after heating over a few minutes, while in contrast, the cabbage leaves lost colour. The solution was cooled before use. The next stage involved spotting and drying of the analyte onto chromatography paper with wax channelling. Various analytes found in a laboratory (e.g. NaOH, HCl) and household materials (e.g. lemon juice and vinegar) were dried onto the channelled paper (layer A of the design in Figure 1) using a range of drying times (seconds, hours, overnight) and methods (air drying, oven drying, heat gun). The analytes were then tested for colour reactions using the anthocyanin solution, which was introduced at the sample inlet of the paper design (layer C). It was established that overnight air drying produced the most brilliant and distinct colours at the different pH values. The analytes were also assayed in the presence of NaCl. The paper-based microfluidics platform in this paper also made use of electronics for an output and NaCl created the conductive salt bridge for the electronics. The analytes were air dried overnight in the presence and absence of NaCl. It was found that the range of analytes dried with NaCl did not have the expected colour reactions as were observed in the absence of NaCl. For this reason, NaCl was dried separately from the analyte in an area of the test that would not interfere with the pH reactions. The volume of anthocyanin solution was also tested to identify the correct amount of solution required for flow through the channels and layers of paper. From this step, it was established that 120 uL of solution pipetted slowly onto the inlet on the first layer of paper was sufficient for the solution to flow through to the last layer and react with the analytes of interest to produce a visual result. As demonstrated in Figure 6, one can track the path of this paper-based microfluidic tool, whereby the flow of the anthocyanin solution is directed by wax channelling towards three analytes housed in separate compartments. Within each compartment, the reagent makes contact with different analytes of varying pH, resulting in a range of colour reactions. In this demonstration, Milk of Magnesia turned green, alkaline solution turned yellow and ammonia turned blue. This is a multiplexing tool with a qualitative output that can also be used for more complex reactions. A quantitative output can be achieved by means of a printed electronics transducer or a handheld reader that converts the result of the chemical reaction to a measurable value. It should be noted that a higher concentration of colour is observed at the edges of the detection zones as opposed to the centre of the detection zones, also known as the coffee-ring effect, and is an important consideration in paper-based microfluidics as discussed by Deegan et al32. In summary, each step in testing the reaction on paper has highlighted the importance of understanding the nature of the reaction and how it will take place under various conditions on a paper-based microfluidic platform. This also creates an awareness of the effect of chemically altering the paper to manipulate the flow of sample on the paper. It is imperative that the optimised reactions on the paper-based microfluidics platform produce sensitive, accurate, specific results to meet the needs of the target market. Sample introduction to the microfluidic device can be achieved manually by using a pipette, or in an automated fashion, for example, via blister packs, which provide a simple and effective mechanism for reagent storage and release. Blister packs have become increasingly popular in microfluidic devices geared towards point-of-care solutions. The limited research on blister packs has focused on numerical modelling33 and sealing of the blister34. Manufacture of blister pack devices often requires specialised materials and equipment, but sample delivery can also be undertaken using simple and cost-effective methods, as demonstrated here. 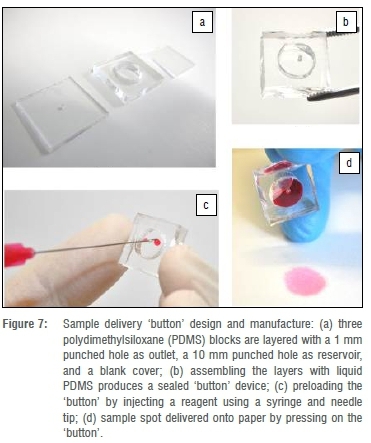 Sample delivery for the demonstration device was achieved by designing and implementing a low cost fabrication method to produce re-usable fluidic 'buttons' using polydimethylsiloxane (PDMS) to mimic the functionality and advantages of blister packs. The 'button', which was designed and manufactured in-house, allows for easy and low-cost introduction of fluids for the test. Similar design and manufacturing methods have been applied in-house for low-cost microfluidic devices.35 The 'button' was realised by assembling three layers of PDMS sheets: a blank top layer, a middle layer with a round opening which functions as a reservoir, and a bottom layer with a hole which forms the outlet. The properties of the sample fluid, such as viscosity and surface tension, can affect the sample volume required for each origami microfluidic device. The volume of sample required also depends on the paper thickness (and hence its wicking ability), the length and width of the fluid flow channels on the device, the size of fluidic connection points, and most importantly, the size of the test result signal shapes. As a result, the amount of sample required on a paper test is dependent on its design. It is therefore recommended that once a device is designed, it is tested with fluid in order to gauge the sample volume requirements. Ideally, the sample inlet should be designed to contain the total volume of sample required to perform the test. This will prevent the need for the user to continually re-load sample fluid, while at the same time not wasting high volumes of fluid. To manufacture the 'button', PDMS was cast in a mould to form a flat sheet with a thickness of 3-5 mm and then cut into blocks of 15 mm x 15 mm. The reservoir of the middle layer was created using a punch with a diameter of 10 mm, which had a volume adequate for the 120 μ! dye samples for the demonstration device. A 1 mm diameter punch was used to create the outlet in the bottom layer. The dimension of the outlet hole was suitable to prevent sample leaking out, while a typical finger press ejected a satisfactory sample volume onto the wicking paper substrate. The three PDMS blocks were then sealed with liquid PDMS or glue to achieve the final assembled button device. Reagents can be preloaded into the button using a syringe and needle by injecting the fluid into the 1 mm outlet hole. The design and manufacturing process of the sample delivery buttons is shown in Figure 7. The promise of printed electronics integrated on paper has attracted significant international attention. An appropriate commencement point for low-cost smart healthcare products in need of considerable processing resources is the hybrid approach of combining rigid electronic components with printed electronics interconnects. A reasonable progression from printed interconnect wiring alone, would be the printing of electrodes36 and communication antennas23, to printed biorecognition and transducer materials19,21, as well as dielectric and semiconductor materials, followed by passive components such as resistive heating elements19, and then active devices36, transistor circuits and memories, heading eventually to integrating a power source20 and display22,36, all potentially contained in a 3D-printed mechanical assembly. The heterogeneous integration approach of having rigid electronic components with flexible printed interconnects is appropriate for PoC healthcare products. In this approach, standard components such as microprocessors, sensor chips and passive components are embedded into paper-based circuits, particularly by using surface mount components. The interconnect wiring network is generated with conductive ink and colloidal nanosilver is by far the most ubiquitous in paper electronics. Laboratory devices have been fabricated by direct writing with either a syringe or a roller-ball pen filled with nanosilver ink36, as well as by spraying conductive ink through a stencil,19 while several digital printing technologies are used, most notably screen printing21 and inkjet printing23 for small volumes and prototyping, and high volume roll-to-roll printing23 for commercial devices. Where equipment is not available, manual painting of electronic pathways using conductive paint provides an effective solution for rapidly developing simple electronics on paper devices. In the demonstration examples here, a nanosilver conductive paint was used to hand-draw conductive tracks. A number of electronic components useful for bioanalysis have been investigated for integration onto paper-based microfluidic devices. A switching element - either a manual button or a chemical reaction region - may be utilised to trigger electronic functions and can most simply be implemented by two conductive pads or electrodes which can be electrically connected in a controlled manner. Components such as light emitting diodes (LEDs) may be employed to display the result of an analysis. The electronic components used for the examples in this paper are off-the-shelf surface mount LEDs and 1 kΩ current limiting resistors where required. These are secured into position on the paper device using glue, and the nanosilver conductive paint is applied to the terminals of the components to complete the circuit. Figure 8 illustrates the design and implementation of a simple paper electronic manual button function with an LED power indicator. A compact CR1220 3V watch battery was used to power the electronics, with an additional paper flap included on the paper-based device to house the battery. The LED was illuminated when the power source made contact and the paper power button was pressed. 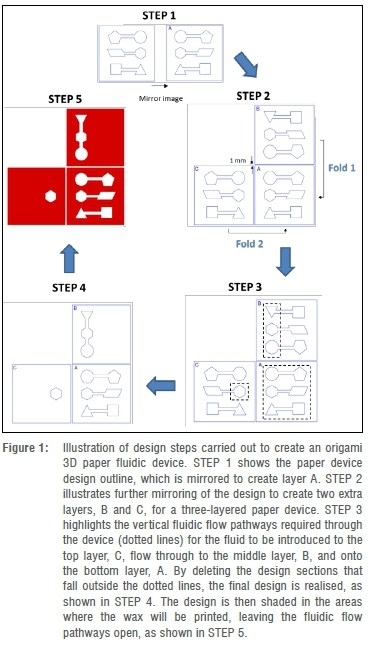 The paper device was designed using a similar principle to the origami microfluidic device in Figure 1, and consists of three layers which can be folded to produce the assembled device. Referring to the design in Figure 8a, at fold 1, the middle layer folds down onto the bottom layer. The top layer then folds over onto the middle layer at fold 2. The grey lines are printed on the paper as guidelines for hand-painting the conductive traces, while the circles indicate where pads must be painted. The LED is connected at the oval dashed shape and the battery is placed at the circular dashed circle. Figure 8b depicts the assembly of the folded device, while the operational device is presented in Figure 8c. When integrating electronics with wax-printed microfluidic paper-based devices, it is desirable to create circuitry over the wax, but without any visible guidelines as to the placement of conductive tracks and components. Adhesive sheeting, which is cut according to the specific design on a vinyl cutter plotter (Roland CAMM-1 GX-24, Telpro Management, Johannesburg, South Africa), can be utilised to create a stencil which can be placed on top of the wax layers to serve asm guidelines for the layout of the electronic circuits. Figure 9 illustrates the use of a stencil design to assist in the positioning of the conductive ink pathways and surface mount components that make up the electronics of the device. The device functions in the same way, and uses the same basic design as the device in Figure 8. The adhesive stencil is stuck lightly over the wax printed device as shown in Figure 9a, and the conductive paint can be applied in the open lines of the stencil directly onto the wax resulting in the device in Figure 9b. Once the conductive paint is dry, the adhesive stencil can easily be removed from the wax device as seen in Figure 9c. The electronic components can then be secured in the relevant places in the circuit and connected with conductive paint to produce the completed device in Figure 9d. An integrated electronics-supported paper-based microfluidic device with a specific application could be developed using the individual components as described in the previous sections. In each case, components could be developed using simple techniques, requiring little to no specialised equipment. In this example, a three-dimensional paper-based device was created using wax barriers. Surface mount electronic components and a compact watch battery, along with manually applied conductive ink tracks were implemented to illuminate an LED once the paper device was assembled and all layers made contact. Furthermore, a second LED was illuminated to indicate that the test was complete. The collage shown in Figure 10 visually summarises the fully assembled and operational device. Using the procedures discussed in the origami 3D fluidic network section, the three-layer microfluidic device was created. A rectangular sample inlet port is on the top layer, and sample fluid passes through four circular intermediate fluidic connection points in order to reach the test result signal zones on the bottom layer. The positions of the circular connection points ensure that sample enters the upper end of each alphabetical character in the 'C-S-I-R' test result symbol. Sample fluid therefore moves towards the lower end of each letter as the test progresses. Once each letter zone is completely filled with fluid, the test is deemed complete. The microfluidic design was printed on a wax printer and then placed on a 255 °C hot plate for 1 min, as described in the origami 3D fluidic network section. To construct the origami device, layer B was folded onto layer C, after which layer A was folded onto layer B. The pH-dependent colour change reactions discussed in the signal reactions section were used as a model multiplexed chemical test. The cabbage dye was introduced via the fluidic button discussed in the sample delivery section of this paper, via the inlet port at the top of the device. After separation into four fluidic paths in the intermediate layer, the sample flowed to the test result section where four individual colour change reactions occurred in each of the 'C-S-I-R' letters. To indicate completion of the test to the user, an LED at the dot of the 'I' lights up once fluid has travelled through the device and along the length of the letter 'I'. A solution of NaCl was dried between the sensing electrodes to ensure electrical conductivity. Stencil designs for manual application of conductive ink were created as a guideline for the positioning of conductive tracks on each device layer, according to the methods discussed in the electronics section of this paper. The circuit interconnection network was constructed on the inside of the folded device, with the electronic components visible on the outside. The conductive tracks were painted onto the wax-printed paper-based device by hand and surface mount LEDs and resistors were secured onto the paper device using glue. Through small pinholes in the paper device, conductive paint was applied to ensure contact between the electronic components and the conductive tracks on the reverse side of the paper device. The wax-printed microfluidic paper device with electronic tracks and mounted electronic components, as well as an inserted battery, was assembled using adhesive layers by means of the approach discussed in the origami 3D fluidic network section of this paper. An LED lights up to indicate that electrical contact between the layers has been achieved and the device is powered. To test this device, cabbage dye was loaded into the sample inlet. The large inlet zone allows for an excess volume of fluid to be contained in the sample inlet, and the user does not have to repeatedly load dye as it is drawn into the device. It is also important to ensure that the bottom layer of the device (containing the CSIR test signal) is not placed onto a hydrophilic surface while a test is being performed. Hydrophilic surfaces may exert additional capillary forces and draw the fluid out of the device before it can complete the reactions. It is better to keep the device suspended in air in order to avoid these effects. However, in the future it may be beneficial to use a transparent, hydrophobic backing on such devices. The fundamental manufacturing steps for starting out with paper-based microfluidics and electronics - and the integration of these on a single origami device - were expounded in this paper. A demonstration electronics-enhanced microfluidic device was developed with emphasis on simple manufacturing methods. The demonstration device lends itself to educational activities affording insight into paper-based electronics-enhanced microfluidics. Additionally, the uncomplicated construction of these devices enables wide experimentation with paper-based microfluidics and electronics in various formal or informal environments. The latter facilitates community engagement which, along with market research, will help tailor devices towards customer need in low resource communities and industry. Educational activities, such as the 2014 'Bring-a-girl-child-to-work day'37, in which high-school students were exposed to the paper-based device development processes discussed here, cultivates an interest in this technology. Stemming from this, innovative ideas and solutions are likely to emerge, and can easily and rapidly be prototyped using existing infrastructure. FabLabs,38 with the many people utilising their facilities, offers an opportunity to test these devices, from a production, manufacturing as well as from a usability perspective. Valuable inputs can be gained for further product improvement. As paper-based electronics-enhanced microfluidic solutions journey through the research, development and innovation chain to commercial success, dedicated production equipment will become necessary. But as the infrastructure required to support a production facility is relatively small, a viable model is distributed production, where manufacturing can occur geographically close to the target market, tailored to local needs in a way that is neither practical nor economical using mass production. In this way, paper-based electronics-enhanced microfluidic devices can provide support for micro-sized entrepreneurial manufacturing enterprises. 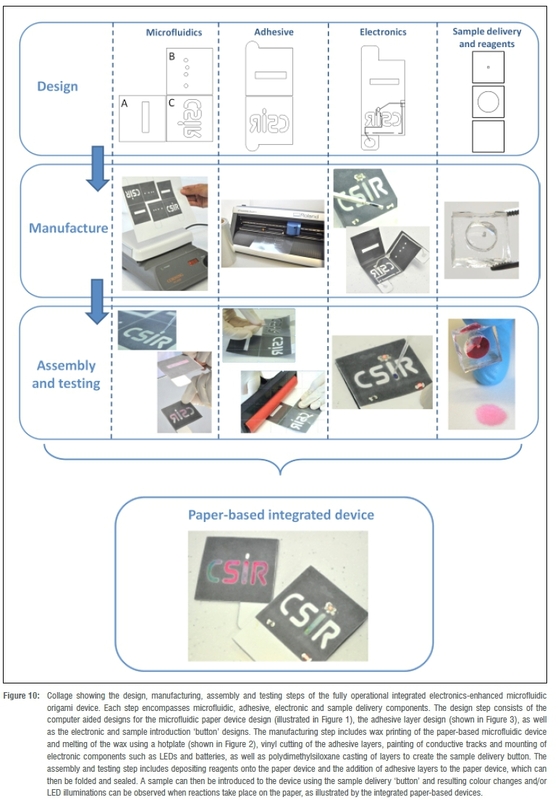 It is clear that following on from the immediate educational use of the developed demonstration tool, there is significant potential for paper-based electronics-enhanced microfluidics in sensitive and cost effective diagnostic applications in health, agriculture and environmental monitoring, particularly for low-resourced areas. We gratefully acknowledge funding made available through the Council for Scientific and Industrial Research (CSIR) parliamentary grant. All authors contributed to the technical work of component development and realisation of the functional integrated device. K.M. led the paper-based microfluidic design and manufacture, U.G. managed the development and testing of the reactions, J.C. was responsible for the sample delivery component design and manufacture, and S.S. headed up the electronic component development. T.J. and K.L. provided guidance and conceptual contributions towards the component and integrated device development. T.J, K.M., S.S., U.G., J.C. and K.L. compiled the manuscript.